Haha. Once upon a time all of my teams (actually, the teams I am a fan of, you know, since I don't actually own them) were horrible losers for many, many years and nobody ever had any hope they would win, possibly ever again. When your team only gets the minimal mention on Sportscenter and then only to laugh at their latest loss, it starts to become a drag to stay a fan. During such trying times I like to criticize the coverage on ESPN (especially during football season because, as a Raiders fan, it is obvious to see the amount of Raider haters/former Bronco players on television) for only covering to same couple of boring teams over and over and over again. But that only goes so far. Talking to other fans helps too. They know what it is like to feel so abandoned by their overpaid athletes who give only the minimal effort because who cares, they are just lazy and stupid and I would fire them if I was the GM. Due to the fact that I am so far away from the majority of the fans of the same teams (besides my immediate family, more on that later), I have to take to the internet. Using the Almighty Google I have found a couple of websites that offer the chance to interact with people of the same love of my teams. 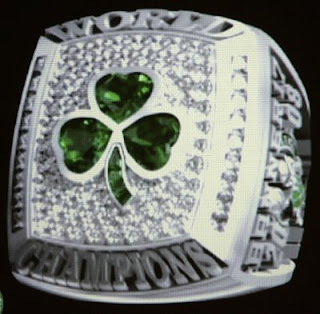 For the Celtics I go to CelticsBlog and for the Raiders I go to the ProSports Daily forums. Reading what other fans say and occasionally chatting with them makes me not feel so alone out here in southern New Mexico. Finally, I try to remember why I became a fan and the good times that I was not alive to witness, but which provide a peak into what is possible. I don't know about you, but the reason I got into my teams was because of my dad. There are pictures of me as a baby shooting a little basketball into my little Larry Bird basketball hoop. I distinctively recall laying on my stomach next to my dad (imitating him) watching the Raiders on the tv, sharing a bag of Doritos while he drank a beer (this was a really long time ago because he quit drinking when I was very young). I remember my parents watching the news when Larry Bird retired and someone, I think it was Nick Anderson, saying something to the effect of, "They're done. When he leaves he's taking the lucky leprechaun with him." I was seven. And it took until this decade for them to become good again. And then really bad again. And then really, really good! Some people may have become a fan of a team for other reasons. Take my dad for example. He became a Raiders fan while watching a Raiders-Chiefs game as a kid. The two teams got into a big fight and the Raiders beat the snot out of the Chiefs. Voila! Raiders fan for life. I think that is pretty awesome. And he became a Celtics fan by reading about the great Auerbach/Cousy/Russell teams in books provided by the bookmobile. So, while you may have bad years (for me the nineties and most of this decade) you can take solace in the fact that you do not follow the crowd. I should be a Cowboys and Lakers fan (I have no idea why so many people here like the Lakers). It would be so much easier. Everyone else around here is! But I like being different. When my team is bad I know people think I am weird for wearing my team hats and shirts proudly. To switch teams and join the crowd would mean a loss of integrity. It is a source of pride. At least. Then, when my team is good it feels even better. Just wait out the bad years and keep your head held high because the reward is sweet. Even if you can not really share it with anybody!